CANNA D-Block is an organic product based on anionic detergents. It cleans and prevents obstructions in drip and spraying systems during cultivation. It also prevents the build-up of precipitant. 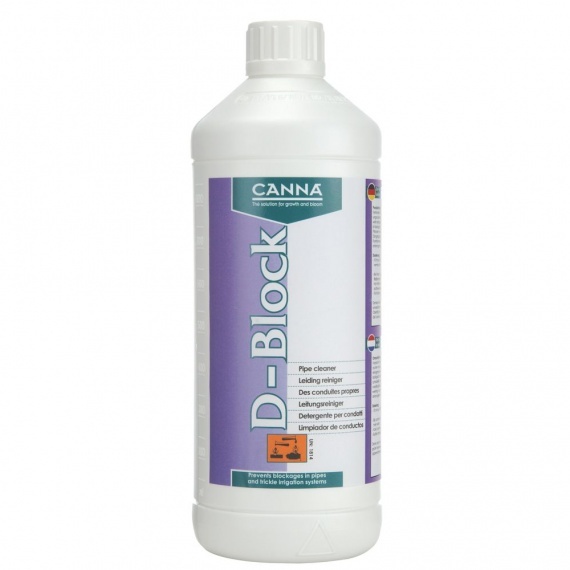 Use CANNA D-Block pre-emptively with every irrigation (the product is completely non-toxic) and make sure that the pipes and dripper remain wet internally between irrigations. Before every new crop, it is advisable to fill the system with clean water and D-Block (with an adjusted pH of 5.2) to protect the system and prevent any obstructions during the next cultivation.